We are specialists in Fort Lauderdale deep sea charters. Deep sea charters in Fort Lauderdale typically refer to fishing charters that take place out on on the ocean. There's no specific depth that constitutes a deep sea charter, but most of our fishing takes place between 50 ft and 1,500 ft.
On a Fort Lauderdale deep sea charter, you'll have the chance to catch a variety of different types of fish. 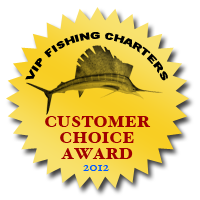 We regularly catch tuna, sailfish, swordfish, wahoo, snapper, kingfish, and grouper. If you're looking to catch a specific kind of fish, let us know and we'll customize your charter to focus on that particular item. Of course, our fishing captains know best, so there might be days where a specific kind of fish is biting and your captain may recommend targetting that type of fish instead. Still, even on a bad day, Fort Lauderdale deep sea fishing is great! One of our Fort Lauderdale deep sea charters, you'll have the chance to fish on reefs, wrecks, drop offs, and in deep water in the gulf stream. Depending on where you are fishing and what you are fishing for, we'll use a variety of fishing equipment and techniques. Depending on the length of your trip and whats biting, we'll focus on specific techniques or try different techniques. All of our deep sea charters are private. That means we can customize your charter to your needs and preferences. Our deep sea charters are conveniently located near most Fort Lauderdale hotels and resorts. Some hotels are even in walking distance.